Sunshine and clouds mixed. Slight chance of a rain shower. High 79F. Winds S at 10 to 20 mph.. Scattered thunderstorms this evening becoming more widespread overnight. Low 53F. Winds ESE at 5 to 10 mph. Chance of rain 80%. “Ike’s” Whistle Stop campaign train makes a stop in Faribault after a similar stop in Owatonna. the date is Sept. 16, 1952. In 2014, 160 beds were distributed. This year, the number is already at 150 in the two counties. Since 2010 when Beds for Kids was founded, 630 beds have gone to needy families. The organization depends on notifications of needy kids from social workers, teachers and from inquires on the web site which is bedsforkidsmn.org. Just imagine the thrill of a youngster that has been sleeping on a couch or even on the floor when a volunteer from Beds for Kids brings their very own bed to their home. A child will receive a metal frame, mattress and box spring (or bunk bed if it applies to the family situation), along with mattress pad, sheets, comforter and pillow. Depending on the donations received the child may also receive a fleece tie blanket, stuffed animal and night light but these are not part of the “standard package” as BFK does not purchase these items. The average cost of a single bed is $190, which includes everything. Currently, BFK are purchasing mattresses and box springs from a supplier out of St. Paul, frames are purchased from Slumberland and bunk beds are primarily purchased from Wal-Mart. The bedding is bought through many retailers based on sales. BFK try to buy local whenever possible, but price is a major driver in order to keep our overall costs low. As in any organization, funds are needed to accomplish their mission. Individual financial contributions can be sent to 320 Wicklow Place in Owatonna. Organizations in Owatonna and Waseca also lend their support. Recently a contribution of $1500 from the Owatonna Home Economics Club (pictured) was graciously accepted. The primary source of income is via private and corporate donations. Last year BFK started applying for grants. 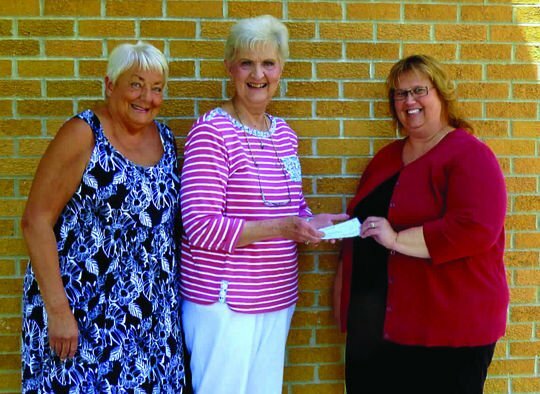 Thus far, grants have been received from the Bremer Foundation, E.F. Johnson Foundation, Waseca Area Foundation and the Legacy of Angels Foundation. Sara and Jim Packard continue to be involved in the organization they founded. Sara is the President of the Board and Jim is an honorary member. Other board members include Matt Stanislav (Vice President), Trent Fast (Treasurer), Ivy Langeberg (Secretary), Shari Kropp (Executive Director), Laurie Mariner and Stacey Ginskey. Jeff Kropp manages the volunteer center and makes the deliveries along with the volunteers. I noted this past week that former Owatonna Mayor, George Kehoe passed away in Atlanta, Georgia. I was fond of George and we go back a long way when he helped govern the city of Owatonna as Mayor. At one time, we broadcast Owatonna City Council meetings live on KRFO. The Mayor was stationed at the west end of the Council lineup. I sat next to him as I engineered the broadcast and took notes of the Council actions. We whispered to each other and passed notes regarding issues that were being discussed. After he moved away from Owatonna, I often sent him newspaper clippings of city matters to keep him informed as to what was going on in the town he loved. I remember when Mayor Kehoe returned to Owatonna from his home for a visit. I self-proclaimed the day as “Mayor George Kehoe Day”. He was flattered and honored. He never forgot Owatonna and his friends here. Occasionally I visit with his son, Clint, who is a member of the Owatonna Elks Lodge. George fought Alzheimer’s disease in his later years and eventually his return notes ceased. Mayor George Kehoe was a colorful politician in town. I heard from a number of readers and their memories of when Presidential candidate Dwight D. Eisenhauer’s train made a stop in Owatonna. 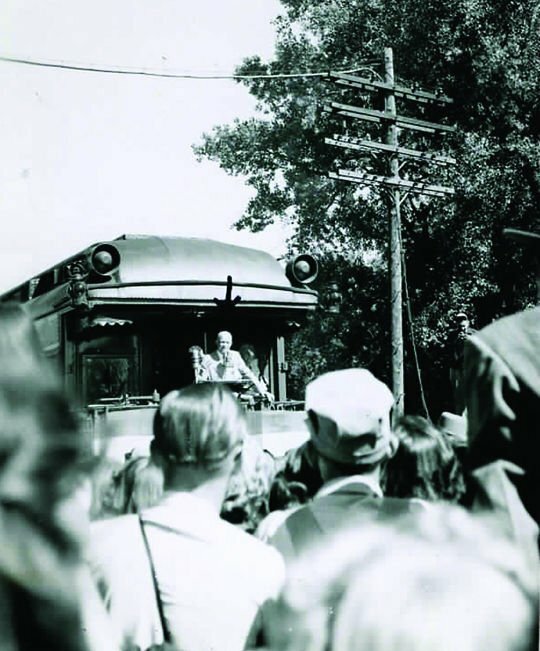 “Ike” was running for President in 1952 and several of you remember your school class that made its way down to the Rock Island depot to see and hear him. Marjean Miller was a resident of Faribault at the time and sent me a photo she took of Ike’s “Whistle Stop” in Faribault. The train made its way to the Twin Cities on September 16, 1952. The Faribault depot still stands today and houses the Depot Bar and Grill. Although the Rock Island depot in Owatonna has long been gone, at one time it was the dream of Owatonna’s Joe Leverty to open a similar dining location in the depot on Riverside Avenue. I remember that I was excited to think that this depot could be preserved and used similar to the one in Faribault. But the neighbors on Riverside Avenue put forth strong objections to city council members citing concerns of heavy traffic and parking issues. City Council woman Roberta Anderson led the charge on behalf of the residents and the project was eventually scrapped. I still think it would have been a neat addition to the selection of dining spots in Owatonna. Former OHS wrestling coach Scot Davis sent me a note about an Eden Prairie wrestler with some local ties. Ben Brancale of Eden Prairie recently won the juniors National Title in Greco Roman up at Fargo, North Dakota. He is the son of Dave Brancale who Davis coached at Portland Junior High in 1971-’72. Davis was the 7th and 8th grade coach and Owatonna’s Jim Herzog was the freshman coach. Ben was a state champion for Eden Prairie this past season. With the early start of the high school football season and the later start of the Steele County Free Fair, for the first time that I can remember our football/cheerleader rally on the last night of the fair will take place AFTER the first game the night before at Mankato West. The early start cuts by a week the practice time for high school teams prior to their first game. The whole adjusted schedule was made necessary as the High School League was informed that the U. of M. football field would not be available for the high school championship’s traditional weekend after Thanksgiving due to a home game of the University of Minnesota. At the recent annual meeting of the Owatonna Foundation Board of Trustees, three new Trustees were appointed. They include Dr. Brian Bunkers, Andy Michaletz and Dennis VonRuden. The three join 32 other Trustees that comprise the Foundation board. The kick-off of the annual fundraising campaign was also marked at the annual meeting. Eighty families from throughout Minnesota are being honored as the 2015 Farm Family of the Year by the University of Minnesota. The farm families will be recognized in ceremonies beginning at 1:30 p.m. this Thursday, August 6, at the annual Minnesota Farmfest near Redwood Falls. Among those being honored is the family of Loren and Bev Krause of Owatonna. The Krause family, which includes five children, will also be honored at the Steele County Livestock Hall of Fame induction ceremony on the first day of the Steele County Free Fair. 2004 OHS grad Brittany Ellingson Humble, daughter of Rick and Deb Ellingson of Owatonna competed last Saturday in the Mrs. International Competition in Jacksonville, Florida as Mrs. Ohio. She placed third in the competition and first in interview. This year’s “Night to Unite” event (Neighbors Joining Together) will be held this Tuesday, August 4. There is still time to register your block. It’s a great time to visit with your neighbors who sometimes you don’t see for weeks or even months. If you still would like to participate, call Pam Roberts at 774-7200. A permanent exhibit at the Steele County Historical Society’s Village of Yesteryear is Gus’ Station which has been beautifully restored by the Ellendale Heritage Society. In the New Richland-Ellendale Star Eagle, Barb Mrotz of the Heritage society wrote about Gus and Hilda Jacobson. I found the bio fascinating, as I didn’t know about this couple who ran that station. It was a Standard Service Station, located half a block from the school in Ellendale. Many students stopped at the station for candy, gum, pop or socializing. In fact, a former student says that in the 1960’s, the school board considered making the destination “off limits” for safety’s sake, but a petition put forth by students squelched that idea. Gus and Hilda came to Ellendale in 1946 from the Bricelyn area where they were both raised, married and farmed for 25 years. They had one son, Arden. They bought the Standard Service Station and a house just two down from the station. This house, presently owned by Angie Blouin, was the Jacobson’s home until their deaths in 1981. It had an upstairs apartment which was rented out. From this address they walked to their business. The station was sold in 1976 to Roger and LuAnn Sommers”. Gus died in May, 1981 at the ages of 92. Hilda died later that year at age 83. Gus had served as Mayor of Ellendale and was active in community affairs. There are three pumps in front of the restored Gus’ station at the village. One of the pumps came from Randy Larson who lives southwest of Owatonna, and one came from Dan Bell who lives south of Ellendale. The third pump has an interesting story behind it. Shelly Dale and her husband Denny, who originally lived in the Blooming Prairie area, purchased an old gas pump at an antique shop in Owatonna and took it to their home in Florida where it has been on display. All the way to Florida, Denny held the glass globe from the top of the pump on his lap so it wouldn’t get broken. Shelly read about Gus’ station and contacted the Ellendale Heritage Society to see if they would want the pump for the station at the Village. The pump was a Standard Oil pump with the glass crown on top that measured the amount of gas pumped. It is not known where the pump came from, but it fit in with the décor of Gus’ station and the EHS indicated they would use the pump at the station. Dan Seykora, who went to Florida to bring his mother back here for the summer, loaded up the pump and brought it back. Shelly Dale shipped the glass crown back here by UPS. The pump arrived here from Florida just a couple of weeks before the Ellendale car show and pancake breakfast so there wasn’t much time to complete the restoration. Lloyd Kaplan, Terry Prokopec and Steve Frederickson restored the pump by hand at Frederickson’s home near Beaver Lake. They got the restoration project completed just before the Ellendale car show and pancake breakfast. Incidentally, the original nozzle from the gas pump was included. There’s an ice cream social at St. Paul’s Lutheran Church of Meriden tomorrow. Serving from 4-7 p.m. Menu includes Steve’s porkburgers, sloppy joes, hot dogs, and root beer floats, pie and ice cream. Supplemental funds by Thrivent Financial. Take in the Elks “Show and Shine” car show today on East Vine from 9 a.m. to 2 p.m. Admission is a free-will donation and registration per car is $10. All proceeds to ALS research. Auditions for Little Theatre of Owatonna’s first show in the 50th season of LTO will be held next Sunday and Monday, August 8 and 9. The show is “The Foreigner” and includes parts for five men and two women. To get a script call Kathy Rush at 507-363-6720 or kathyarush@gmail.com. Owatonna Bus Co. is now hiring school bus drivers for Owatonna, Blooming Prairie and Medford. No experience needed and OBC will help with training and licensing. Call 451-5262. The “Good Time Band” plays for entertainment tonight in Ellendale. This Thursday night “Boiling Point” will play in Owatonna’s Central Park at 7 p.m.
Todd Hale can be reached at thale@scff.org or write him at 632 14th St. S.E., Owatonna, MN 55060.